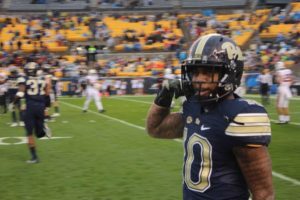 PITTSBURGH—Pitt junior all-purpose player Quadree Henderson has been named the Atlantic Coast Conference’s Specialist of the Week for his performance in the Panthers’ 31-14 victory over Virginia this past Saturday. Henderson once again showcased his explosive ability as a return specialist when he took a punt 75 yards for a touchdown against the Cavaliers. Eluding numerous defenders down the right sideline, his TD gave Pitt a commanding 21-0 lead in the second quarter. It was the third punt return touchdown of Henderson’s career and his second in 2017. He owns a Pitt-record seven kick return touchdowns overall (four coming on kickoffs). A consensus All-America return man last year, Henderson is only one kick return touchdown shy of the national record of eight held by nine different players, including Clemson’s C.J. Spiller (1 punt and 7 kickoffs from 2006-09). Spiller, incidentally, was also coached by Pitt special teams coordinator Andre Powell. This is the second time this season Henderson has been honored as the ACC’s Specialist of the Week. He was initially honored following the Sept. 23 Georgia Tech game when he had an 80-yard punt return touchdown. For his career, Henderson has earned the ACC’s weekly specialist honor seven times. The Panthers are open this week before hosting Coastal Division foe North Carolina at Heinz Field on Thursday, Nov. 9, at 7:30 p.m.